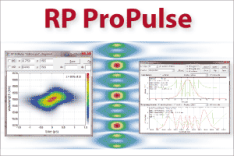 With the RP Fiber Power software, one simulate the compression of ultrashort pulses – for example, by spectral broadening in a fiber amplifier or passive fiber, followed by dispersive compression with a pair of prisms or diffraction gratings, or with a numerically optimized compressor. Linear pulse compression: When pulses are chirped, their duration can be reduced by removing (or at least reducing) this chirp, i.e. by flattening the spectral phase. Dechirping can be accomplished by sending the pulses through an optical element with a suitable amount of chromatic dispersion (→ dispersion compensation), such as a pair of diffraction gratings (a grating compressor) [1, 6], a prism pair , an optical fiber, a chirped mirror, a chirped fiber Bragg grating or a volume Bragg grating. The smallest possible pulse duration is then set by the optical bandwidth of the pulses, which is not modified by dispersive (linear) compression. In the ideal case, bandwidth-limited pulses are obtained. Nonlinear pulse compression: In a first step, the optical bandwidth is increased, typically with a nonlinear interaction such as self-phase modulation. In most cases, this leads to chirped pulses, often with a duration which is even larger than the original pulse duration. Thereafter, the pulse duration can be strongly reduced by linear (dispersive) compression (see above), which removes or at least decreases the chirp. A special case is compression using a chirped QPM structure . Here, a χ(2) nonlinearity is used not for spectral broadening, but rather for frequency-converting a strongly chirped pulse such that the converted pulse is not chirped and thus much shorter. Originally unchirped pulses can be spectrally broadened by propagation in a normally dispersive optical fiber and then dispersively compressed as discussed above in the context of linear pulse compression . The fibers used for spectral broadening may be standard optical fibers, photonic crystal fibers, or hollow fibers (for extremely intense pulses). It is possible e.g. to start with picosecond pulses from a mode-locked Nd:YAG laser and reach pulse durations far below 1 ps, or to generate few-cycle pulses starting from pulses with e.g. 50 fs duration. Figure 1: Setup for pulse compression with a normally dispersive fiber and a dispersive compressor. For high-intensity femtosecond pulses, the spectral broadening can be performed in a gas-filled hollow fiber or capillary . Most of the optical power propagates in the gas, where self-phase modulation occurs. (The regime with ionization of the gas is avoided by staying at sufficiently low intensities.) Subsequent dispersive compression can be done, e.g., with double-chirped mirrors or some other kind of dispersive mirrors. This method is suitable e.g. for compressing 20-fs pulses with millijoule energies down to a few femtoseconds. After spectral broadening with a nonlinearity as described above, pulses can also be shorted by sending them through a suitable bandpass filter (and no dispersive element), if the filter bandwidth is well below the pulse bandwidth . When high-intensity few-cycle femtosecond pulses are injected into a gas jet, high harmonic generation can occur, and under certain circumstances pulse durations of a few hundred attoseconds are achieved [23, 24]. In higher-order soliton compression [5, 39], a pulse with an energy far above the fundamental soliton energy is injected into a fiber with anomalous dispersion. After a certain propagation distance, a strongly compressed pulse can be obtained, but the choice of propagation distance can be critical. The pulse energy can be roughly one to two orders of magnitude above that of a fundamental soliton. Figure 2: Setup for pulse compression with a fiber only. The compression mechanism could be higher-order soliton compression or adiabatic soliton compression. In adiabatic soliton compression [10, 12], a soliton pulse is compressed during propagation in a fiber the anomalous dispersion of which becomes weaker and weaker along the propagation direction. Alternatively, the pulse energy can be increased by amplification in a doped fiber with constant dispersion properties. The pulse energy is fairly limited due to the small soliton pulse energies of typical fibers. In a fiber amplifier with normal dispersion, self-similar parabolic pulses experience spectral broadening while a high pulse quality is preserved . The parameters of the input signal pulses are fairly uncritical, and high pulse energies are possible. The resulting linear chirp makes it relatively easy to obtain strong temporal compression in a subsequent dispersive optical element. Figure 3: Setup for pulse compression with similariton pulse propagation. While the pulse is amplified in a rare-earth-doped fiber, its duration and spectral width both increase. A dispersive compressor can subsequently reduce the pulse duration strongly. Pulse compression can also occur during nonlinear frequency conversion [11, 21, 25, 32]. Under certain circumstances, frequency doublers or optical parametric oscillators can emit pulses which are much shorter than the pump pulses. Which of these methods is most suitable depends on a number of circumstances, including the initial and required pulse duration, the pulse energy, and the demands on pulse quality. 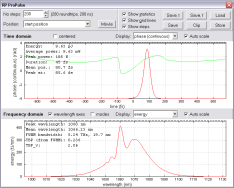 Pulse compression setups can be analyzed and optimized using pulse propagation modeling.